The system will provide spoken instructions which you can follow in order to access the different features of the jobline system. Below is an outline of the jobline features and some of the menus and prompts you will encounter when you access the jobline. After you call the number of the Jobline System, you will be prompted to input your UA card number or your social security number. Once you have entered the number correctly, you will be granted access to the system. You will hear your out of work list number, followed by your registration date and time. If you choose to register for the out of work list, you will hear a confirmation message then be returned to the main menu. If you are not eligible to access the list of available jobs, you will hear an access denied message and the reason for this status. If you choose to apply for a job, you will be asked to enter the best phone number to contact you at. After you enter the number, you will hear a confirmation message. If you choose to cancel a job that you have applied for, you will hear a confirmation message indicating that you have successfully canceled your application. If you choose to pay your balance, you will be asked to enter your credit card number, then the expiration date in the format MMYY, followed by the security code (also called CVV or CID) which is a 3 or 4 digit code, which is typically located on the back of your card in the signature box or on the front of American Express cards. Once you’ve entered this information, you will hear either a confirmation message indicating that the payment was made successfully, or a message giving the reason that the transaction was declined. Local 412 has implemented a new dispatching procedure and Job Line. Please read the information on “How to use the Job Line System” (left) as well as the following “New Dispatching and Job Line Rules”. PLEASE NOTE: The new Dispatching procedure will officially take effect May 1, 2015. Local 412 will maintain a Job Line automated phone system. Referral information will be placed, when applicable, on the Job Line phone system. This system will deliver instructions to the Applicant, regarding how to access the system using his/her personal identification number (Union Card number or Social Security Number). Once an Applicant has gained access, they will be able to review and apply for all available job referrals. Whenever an Employer requires a journeyman or apprentice, plumber or pipefitter, welder, service worker on any job, he shall notify the Business Manager of the Local Union or the representative designated by said Business Manager at the Local Union office by Local Union No. 412’s Manpower Request Form, stating the location, starting time, approximate duration of the job, the safety requirements, the type of work to be performed and type of workers needed (Plumbers, Pipefitters/Steamfitters, Welders, HVAC or Refrigeration), and the number of each type of worker required. Employers requesting an Applicant must do so before 2:30 p.m. in order for the job to be cycled through the Job Line that same day. Requests received after 2:30 p.m. will be processed on the Job Line the following business day. An Applicant seeking referral shall call the Job Line toll-free at (844) 8-JOB-412 or (844) 856-2412 from 4:30 p.m. until 8:00 a.m., Monday through Friday and all day on Saturdays and Sundays. After listening to the job referral information, the Applicant will be instructed to press certain keys on his/her phone to be considered for any job(s) listed. If an Applicant changes his/her mind, he or she may call back to the Job Line and edit their selection, prior to 8:00 a.m., in order to delete or remove his/her name from consideration. Only qualified Applicants should use the Job Line and they may not authorize anyone to use it on their behalf. It is the responsibility of the Applicant to be available after 8:00 a.m. the following business day so that the Business Manager or designated representative can contact the considered Applicant(s) in the order his/her name appears on the out-of-work list to obtain confirmation of job acceptance. If the Business Manager or designated representative cannot reach the Applicant at the telephone number left by the Applicant, the Union Representative will call the next Applicant requesting job referral. An Applicant can refuse a job after they have accepted the job on the Job Line. After the Applicant refuses three (3) jobs, the Applicant’s name will be moved to the bottom of the out-of-work list. Prior to renewal or reinstatement of a Journeyman Certificate of Competence in the applicable classification, the applicant is required to complete a minimum of sixteen (16) hours of approved course work. Proof of completion of such course work, in a form satisfactory to the Construction Industries Division (CID) must be submitted with the application for renewal or reinstatement. 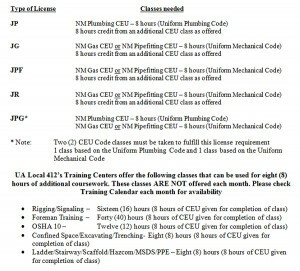 A minimum of eight (8) hours of approved course work must cover the current CID code that is enforced by each Journeyman Classification to be renewed of reinstated. Please see the License requirements below. ~ You can get a 6 month extension to get CEU’s from expiration date of license but you have to get your CEU’s in that time frame or you have to retest. ~ Mail completed form with your proof of CEU’s. *Make sure you have form notarized! ~ If you are past your original date to renew your license then you will be charged an additional $25.00. You must renew within 6 months past expiration date of license or you will have to retest!!! ~ If you follow the above steps you should be able to get your license renewed. If you have questions, call NM CID and they will be glad to help you.